On the feast of All Saints, we honor all the saints who lived in the divine love, both the known saints and those who are unknown or forgotten. There are too many saints for every one of them to have his or her own feast, and there are many saints who were not recognized as such here on earth, or if they were recognized, only by a few. May this "great cloud of witnesses" also spur us on in recalling that we too are called to be holy as our Lord is holy, we are called to take up our cross, to give our lives, to follow after him in love. Leon Bloy wrote, "There is but one tragedy: not to be a saint." Likewise there is only one real "success" in life: to be a saint. 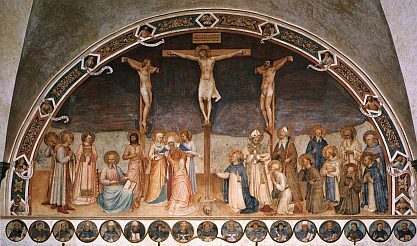 In this image by Fra Angelico, the saints are depicted in adoration before Christ on the crucifix, who is the source of all holiness. The saints also in heaven worship the "Lamb who was slain."